Everyone knows that all brides are beautiful and traditionally they wear white. Some brides opt for the not so traditional custom of wearing other colors. Bridal gowns are made in many colors so each bride will find the dress she dreams of. Some brides look for black wedding dresses as a way to express their individuality or because they are planning a Halloween or Gothic wedding. 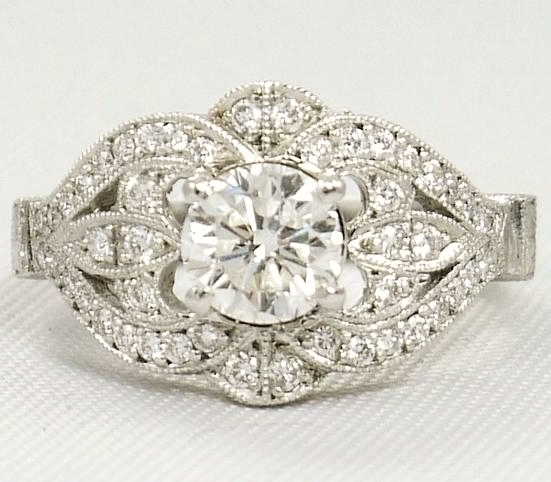 They may decide on this color as part of the wedding colors and want their dress to stand out. For whatever reason a bride chooses black for her dress, she will find several breathtaking styles available at bridal shops and online at places including eBay, Wedding Dress Fantasy, and DHgate. Black gowns for brides come accented by other colors including pink. A soft shade of pink is a beautiful contrast to the black in this strapless A-line gown featuring polka dot tulle. The gown has a multilayered skirt for added fullness and a lace-up back closure. A pleat handmade flower sash adorns the stunning gown found at DHgate. 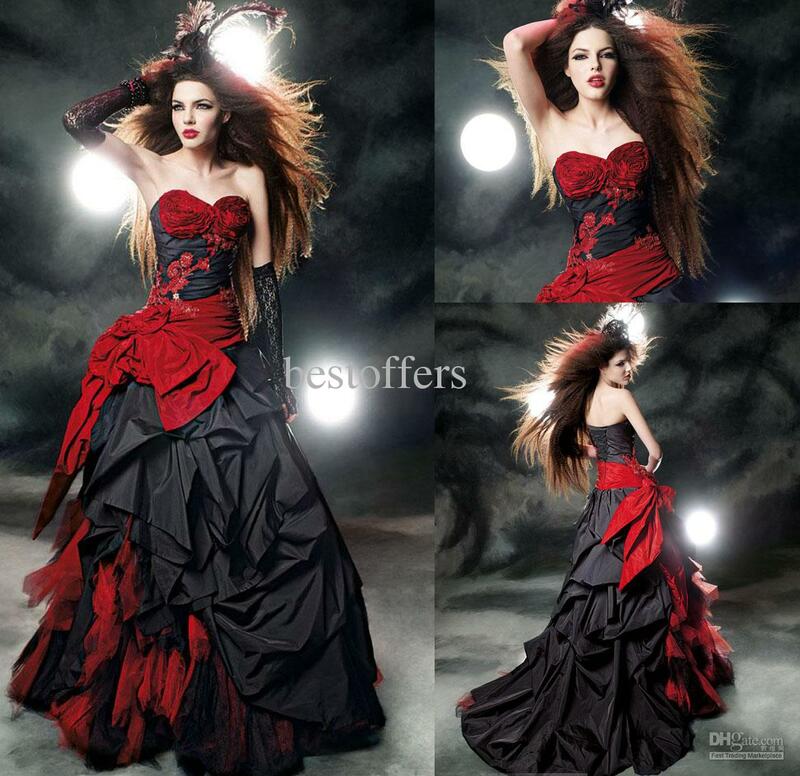 Brides looking for brilliant color to contrast with a black gown can choose this floor length black and red wedding gown found at DHgate. The strapless gown has a fitted sweetheart bodice with a full black ruffled skirt with brilliant red added for contrast. The gown is made of taffeta and tulle in an A-line style with a red sash and beaded appliques. This elegant black and white bridal gown from Hi Bridal features a one-shoulder design. The black fitted bodice and form-fitting waist flow into a full train. The sheer overly of the white skirt is embellished with black lace and has a black lace edged hem. The custom gown is an ideal way to have traditional white as well as the dramatic black in your gown. 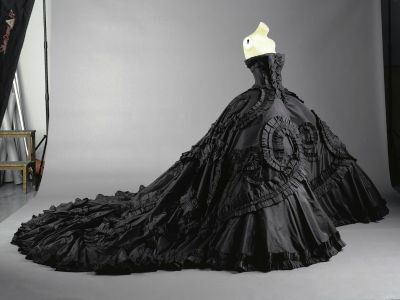 This black Goth wedding gown, found on eBay, features a boned bodice and padded bust for extra support. The stunning one-shoulder designed gown has a lace up back closure that ensures a snug fit. The full bustle skirt is made of satin with an organza overlay and has beautiful embroidery and beading. The floor length gown flows gracefully around the bride ending in a short train. You can find this stiking Vintage Gothic black wedding gown on eBay. The floor length dress is made of satin and features embroidery, beading, sequins, and lace on the bodice, waist, and skirt. The bodice is fully boned for support and the corset closing in the back ensures a snug fit. 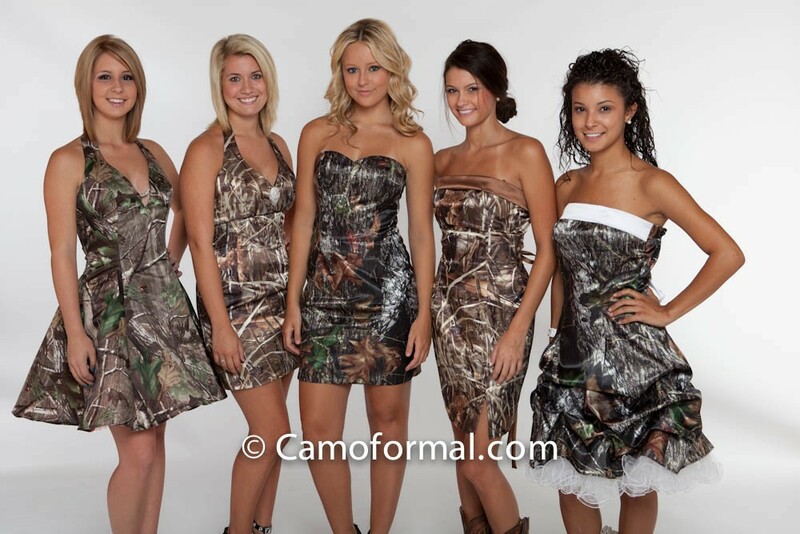 The dress comes with detachable straps and a full train. This beautiful strapless black wedding gown features sequins and tulle as well as feathers. The feathers adorn the bodice of the boned and fully lined floor length gown. It is made of satin with a tulle overlay. The fitted bodice has sequins that sparkle down to below the waist, which has a sash and a sparkling flower accent. The stylish dress is available online at DHgate. 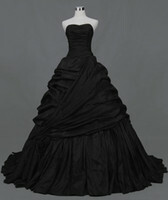 This mermaid style wedding gown in black offers a soft and demure look and it can be found at DHgate. The custom gown has long sheer sleeves with lace appliques. The sheer material overlays the sweetheart neckline and covers the shoulders dipping to a deep V in the back. The form fitting dress is made of tulle and satin and pools into a sweep train. This lovely vintage halter style black wedding gown is sold at DHgate. The tulle dress is embellished with lace appliques and beads. The full skirt flows down from the fitted waist into a full train. A sheer lace panel accents the back of the dress at the waist for a feminine look. This strapless A-line style is another stunning black bridal gown that you can find at DHgate. The taffeta gown is embellished with beads and ruffles. The full skirt flows out from the snug fitting waist falling gently to the floor in layers of ruffles and pleats that flows into a brush train. The top of the dress has a corset style that laces up the back. A black bridal gown in a ball gown style makes any bride feel like a princess. This floor length taffeta gown is strapless with a court train. It has pleats and ruffles on the full skirt and a lace up back closure that ensures a snug fit. This dramatically beautiful gown can be found on DHgate.